While there are many similarities between the 2017 and 2018 models, we think that the new additions to the 2108 model make it a better overall buy. If you’re looking to compare models, come down to our dealership serving Wabash Kokomo Fort Wayne Indiana customers and check out both models in person. You can call, visit our dealership or just go online to find out more about these vehicles. The new car is designed to provide you with an exceptional level of service and reliability, and no matter what model year you go with, you’ll be getting an efficient and fun vehicle to drive. When you come down to our dealership, you can check out both models on a test drive, and you’ll be able to get a whole host of options to make your next vehicle purchase more worthwhile. The exterior changes on this vehicle are designed to provide you with a better overall level of aerodynamics. While some shaving has been done to the outside of the car, in a lot of ways, the shell is the same in the 2018 and 2017 model year. The four corresponding packages are available for both model years, but there are some small changes within each trim level. For example, you’ll still have the option of getting the Sport, Trailhawk, Latitude and Limited models. Most of the changes are limited to various bells and whistles regarding options that have been added to the vehicle. Otherwise, the car does look mostly the same as the 2017 model year. Some notable changes to the exterior include a black roof, black side roof rails, adjustable power mirrors, and a windshield wiper de-icer on the highest trim level. In contrast, none of these were options on the previous model year. If you’re looking to compare models, come down to our dealership serving Wabash Kokomo Fort Wayne Indiana customers to find out how they differ. You can call, visit our dealership or just go online to find out more about these vehicles. Not a lot has changed with the interior of the new model year. However, there are a few subtle changes that could help sway you one way or the other. The new model comes with cargo tie downs, a dual-pane sunroof and a heated steering wheel on certain trims. The vehicle also has a black and sky grey interior that wasn’t available in the previous model year. When it comes to the heated front seats, those are brand new and not previously available on the 2017 model. 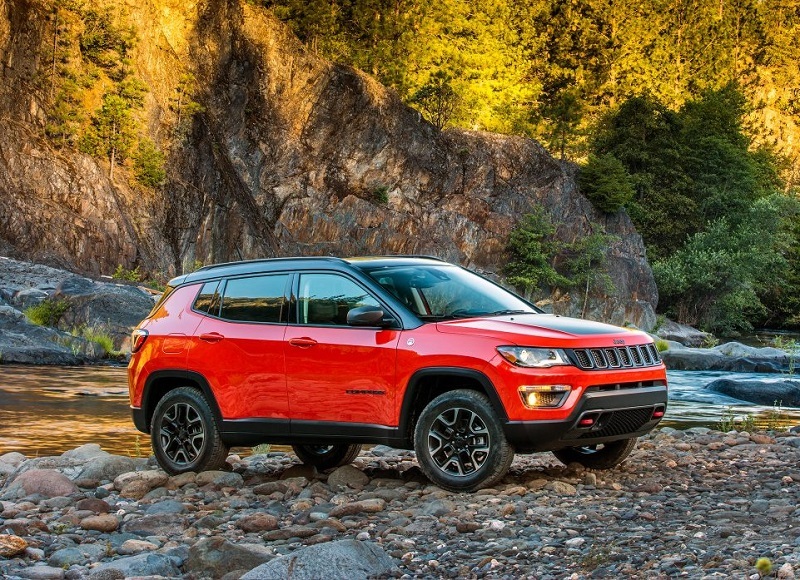 The 2018 Jeep Compass and the 2017 Jeep Compass are available at Wabash Jeep. Come down and explore your options at our dealership. Let us help you get the best vehicle for your situation. With all of the changes to the vehicle as a whole, you’ll get some amazing deals and options to make this vehicle one of your best options yet. When it comes to mechanical changes, you have a lot to be excited about. The vehicle now features battery rundown protection, which is probably the most exciting innovation yet to come to this vehicle. To prevent your battery from dying, the vehicle can shut down when it’s in idle and not running off gasoline. The vehicle also comes with some smart enhancements to the engine and suspension systems. If you’re looking to compare models, come down to our dealership serving Wabash Kokomo Fort Wayne Indiana customers. You can call, visit our dealership or just go online to find out more about these vehicles. Most of the safety features have remained the same between both model years, but the safety and security features of the 2018 model include a few additional options. The rear back up camera is now a requirement for the 2018 model year, so you’ll be able to get that camera included in the price for much less. Additionally, there is a new blind spot and cross path detection system that is available to help you stay safe on the road. Most of the other safety features are included on both the 2017 and the 2018 model years. Come down and experience all of the features that you can take advantage of when you get a new 2018 model. The 2018 Jeep Compass and the 2017 Jeep Compass are available at Wabash Jeep. Come down and explore your options at our dealership. Let us help you get the best vehicle for your situation. Our dealership will work with you to get a great deal on your next vehicle. There are also some smart options that are designed to give you an exceptional level of security and safety. When it comes time for you to get a new vehicle, give us a chance to help you sort through your options. The 2018 Jeep Compass and the 2017 Jeep Compass are available at Wabash Jeep. Come down and explore your options at our dealership. Let us help you get the best vehicle for your situation.